Urbane Male is another one of these brands and its founders are well experienced in the beauty and grooming industry. I have to say I didn’t expect much when I opened the post bag and peered inside. The bottles are excellent with great pumps, a good shape and a really decent size. The branding however, stinks. Poor branding is often a characteristic of some of the younger upstart grooming and beauty brands. It’s very uninspiring and due to the nature of first impressions you’d often want write off what’s inside; particularly if you’re buying online as you’ve only got pictures and presentation to go on (the website is also, interesting). But all that superficial stuff aside, it’s what’s inside that counts and what’s inside these bottles really, really counts. Men’s grooming products often have the nastiest, cheapest, stinkiest fragrances going. It’s all cheap base notes that are supposed to make a product smell masculine. Well you won’t find that here, oh no, the fragrances in these products are excellent; I can’t stress that enough. There’s a definite blend of top, middle and base notes that combine to make a full-bodied scent. There’s Patchouli & Coriander, my favourite; Sandalwood & Vetivert that’s deep and musky; Bergamot & Oakmoss, an almost soapy but slightly sweet scent; finally a sultry and zingy Lemongrass & Amber. I say Patchouli & Corriander is my favourite but I have to say, they’re all my favourite. Ingredient wise, it just gets better. There’s glyicerin, a fabulous water based moisturiser that helps bond moisture to surface skin cells. Aloe Vera calms the skin due to its fabulous anti-inflammatory properties and also seems to work in this product as a lubrication booster. Almond oil, another great moisturiser, gently nourishes the surface of the skin and helps to prevent it drying out which is a definite concern when wet-shaving. Finally Yarrow Leaf and Comfrey both sooth the skin, reducing inflammation and calming any redness and itching from shaving. Oh, by the way, buy yourself some comfrey ointment if you ever get chance, it’s great for clearing up bruises! Apply the product onto wet skin and get massaging. It foams incredibly well, coating your skin with a thick and concentrated lather. I found after playing around that you get even better results using a shaving brush, a staple wet shave accessory, softening hairs and smoothing the skin. As you begin to shave, you’ll notice that the product creates and excellent lubricating barrier against the skin. There’s an almost globular texture to it which I’m pretty sure is the result of the high ration of aloe leaf juice but this ensures that you don’t start cutting into yourself which I’m sure you know is easily done. After shaving, my skin is almost always gasping. I fight daily with sensitive skin and shaving is one of those things that sets me off 9 times out of 10. This is nothing to do with the way I shave but almost always what I use, often due to shaving products formulated with a lot of alcohol; well there’s no alcohol here. 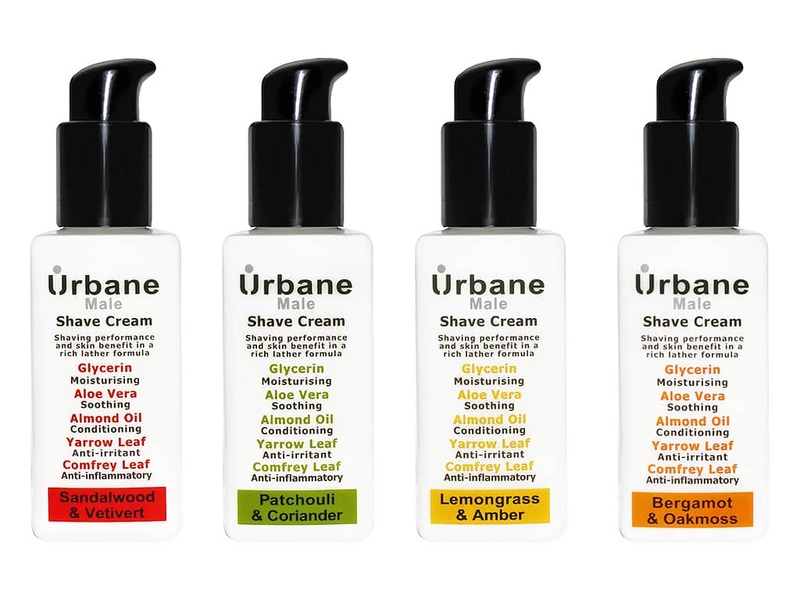 With the Urbane Male shave creams, I experienced no sensitivity whatsoever – not an itch, not a blotch. There’s a range of shave gels, moisturisers and after shave balms currently in development that I’m certainly looking forward to. But for the time being, you really should check these creams out. They’re priced at just £10.45 each and available here on their website with £2.50 delivery. This article first appeared on MANFACE written by Thom Watson. It was published on Friday 16th August 2013 and was last updated on Monday 3rd April 2017 at 3:30pm. It's categorised under Razor Burn / Shave Rash, Sensitive Skin, Shave, Urbane Male where you'll find more related content. I have used this product (normally i use Clarins shaving cream) – while the packaging may not be as sleek as others, the product itself is excellent. Very smooth shave and high moisturising effect – I preferred it to Clarins, it is cheaper and so far it seems to be lasting twice as long! It will be a commercial failure without a re-think of the packaging, as you say. However good it may be, no-one will ever know if they cannot be tempted to take it off the shelves. I wouldn’t buy it, but I’m a sucker for good-looking products, therefore I’m either a lost cause or a marketing man’s dream!